-Like USC, Oklahoma, Texas and Ohio State before it, one of the sport's marquee names, Alabama, is looking for a return to glory under a charismatic savior doubling as a football coach. 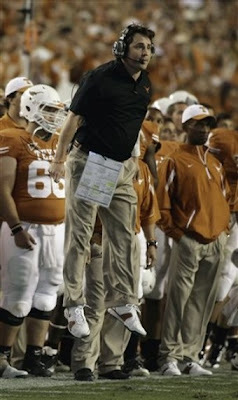 -Texas runs a wide-open spread offense; the Crimson Tide runs a more traditional pro-style attack. -The power conferences are represented in the title game, at the expense of some mid-major upstarts. -In a decade that celebrated the "cult of the coordinator"–Norm Chow, Bo Pelini, Mike Stoops, Gene Chizik, Gus Malzahn–both staffs feature hot young assistants in Will Muschamp of Texas and Alabama's Jim McElwain who may hold the key to their teams' fates. And, of course, 'Bama has a chance to add yet another chapter to the story of the decade: the rise of the SEC juggernaut. When UT's offense is really humming, opponents typically suffer a death of a thousand cuts. The Longhorns' offense revolves around a pretty simple game of pitch-and-catch. With uber-accurate senior quarterback Colt McCoy running the show, offensive coordinator Greg Davis loves to spread defenses out and leverage a talented receiving corps with short pass patterns and timing routes. It all starts with the near-telekinetic duo of McCoy and sixth-year wide receiver Jordan Shipley. Shipley finished the year with an average of more than eight catches per game, good for fifth in the country. His blazing speed also makes him a legitimate downfield threat. Take Shipley's quickness and route-running ability, mix in McCoy's pinpoint accuracy and combine some uncanny chemistry and you have a lethal passing combination. The 'Horns have had far less success moving the ball on the ground–it often appeared as though Davis relied on the run game to keep defenses honest. UT averaged 4.09 yards per carry this season, 68th overall. Texas uses a rotation of four solid but unremarkable backs, with McCoy occasionally doing some damage on scrambles and designed quarterback runs. Alabama's talented D is the kind of rugged unit that Nick Saban became known for way back when he was Bill Belichick's right hand man with the Cleveland Browns. Besides being taught by one of the best defensive minds in the game, the Tide is loaded on all three levels with big, fast athletes who play a disciplined style of hard-nosed football. As Brown notes, Saban strives first and foremost to control the middle of the field. As such, the heart and soul of the Tide D is All-American linebacker Rolando McClain, who's expected to play through his recent illness and then head off to the NFL. Gargantuan defensive tackle Terrence Cody anchors the defensive front. Unlike standout contemporaries Ndamukong Suh and Gerald McCoy, Cody operates more like a run-stuffing space eater than an active antagonist of interior offensive linemen. Think Sam Adams with the 2000 vintage Baltimore Ravens. The Tide's meat-and-potatoes offensive strategy revolves around a talented and physical offensive line that paves the way for young running backs Mark Ingram and Trent Richardson. The Tide's runners hammered away at opposing defenses an average of 42 times per game, producing 5.10 yards per carry, good for 11th in the country. As the key cog in Alabama's big crimson machine, Ingram carried the Tide's water, rushing for an average of 120 yards per game and more than six yards per carry. Occasionally, Ingram played some wildcat quarterback to give the 'Bama O a spark. When it comes to throwing the ball, Alabama is surprisingly efficient. While quarterback Greg McElroy played poorly at times, one area where he has excelled is protecting the football, a must for any thrower playing for Nick Saban. McElroy threw just four interceptions all year. Julio Jones and Marquis Maze offer two dangerous options at receiver. Although Jones hasn't quite lived up to the billing he received as an all-star recruit, he's a looming threat to take it to the house any time he's on the field. As evidenced by McElroy's stellar 17-4 ratio of touchdowns to picks, 'Bama turnovers are few and far between. The Tide gave the ball up just 10 times all season. On the year, Saban's squad has a turnover margin of plus-16, fifth best nationally. Texas defensive coordinator Will Muschamp learned from the master who will be on the opposing sideline Thursday. Like any Saban-coached defense, Muschamp has built an aggressive unit whose game is predicated on speed–the better to pressure passers with. Coach Blood won't hesitate to call for a blitz from just about any player in any place on the field. The fact that opposing offenses also have to account for talented pass rushers Sergio Kindle and Sam Acho makes the 'Horns all the more dangerous. The cornerstone of Texas' defense is the best secondary in the country, led by safety Earl Thomas. UT's rangy DBs hawk the ball and may be tops at swooping in to turn interceptions and fumbles into six. Additionally, as Oklahoma quarterback Sam Bradford learned all too well, Muschamp is outstanding at designing creative ways to use their speed to surprise opposing passers. Oh, the 'Horns also happen to boast the top-rated run defense in the country, allowing a shade under two yards per carry and a little more than 60 yards per game. For Lone Star State legends McCoy and Shipley, this game offers them the opportunity to write a storybook ending to their careers as Longhorns. With how last year ended for UT, it's tough to ignore that "meant to be" feeling to the moment. In contrast, after years of wandering the desert, Alabama's rabid fans are foaming at the mouth for another crystal ball–or whatever they used to hand out in the '60s–to add to the trophy case. No real edge either way here. If Nick Saban is smart–and he is, very much so–he's been preparing his defense for a heavy dose of the no-huddle, hurry-up offense from Texas. Last season, Utah employed such a strategy with great success in its Sugar Bowl win against 'Bama. The same goes for Auburn this year, which was one of only two teams to hit pay dirt three times in a game against 'Bama. That strategy also enables Colt McCoy to better dictate the course of the game. If Texas owns one particularly significant advantage in this game, it's the quarterback position. McCoy didn't really blow opposing defenses away this year like pundits predicted, but he's still a seasoned signal caller with more wins under his belt than any other quarterback in college football history. Putting the game in his hands has worked out pretty well for Mack Brown and Co. in McCoy's four years as a starter. Don't see why they wouldn't want to dance with who brought them to this point. 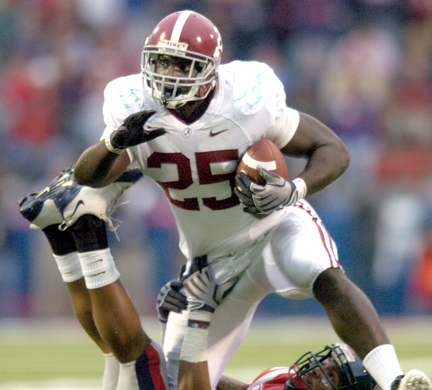 McCoy's 'Bama counterpart is a bit of a different story. 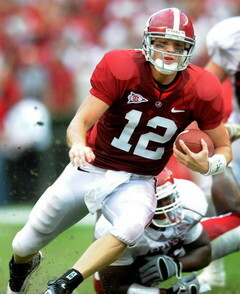 For the moment, everyone remembers Greg McElroy as the guy who lit up Florida's fearsome D in the SEC title game, completing 12 of 18 throws for 239 yards and a touchdown. Yet, his body of work covering the entire year suggests he's more Accord than Camaro. Thus, given the strength of the Tide runners, expect Muschamp to load the box. Texas will rely on its talented defensive backs to win their one-on-one match-ups against Alabama's receivers should McElwain try to sprinkle in a few more play action passes than usual on early downs. McElroy will be charged with not losing the game, though, because in the end, everything hinges on Texas' ability to keep Bama's grinding running game at bay. Going by the numbers, this should be no sweat for the nation's top-ranked run defense. Yet, the Longhorns' stout run defense may be fool's gold. On a yards-per-carry basis, the best ground game UT faced in 2009 was Sun Belt foe Louisiana-Monroe (4.5 yards per attempt, tied for 39th overall). Moreover, you won't find an offense resembling Alabama's power attack anywhere on Texas' schedule. Will Ingram and Richardson steamroll Texas' defense? Probably not. But they'll have more success than any of Texas' other opponents have this season. Bottom line: This game has all the makings of a brutal war of attrition, but 'Bama has passed the stiffer tests this year. The 'Horns faced two defenses on par with the Tide this year, Oklahoma and Nebraska. Yet, while the Sooners and Cornhuskers struggled mightily to move the ball against the Texas D, UT still needed both opponents to commit some critical errors to pull off those wins. Saban's teams don't make those mistakes.